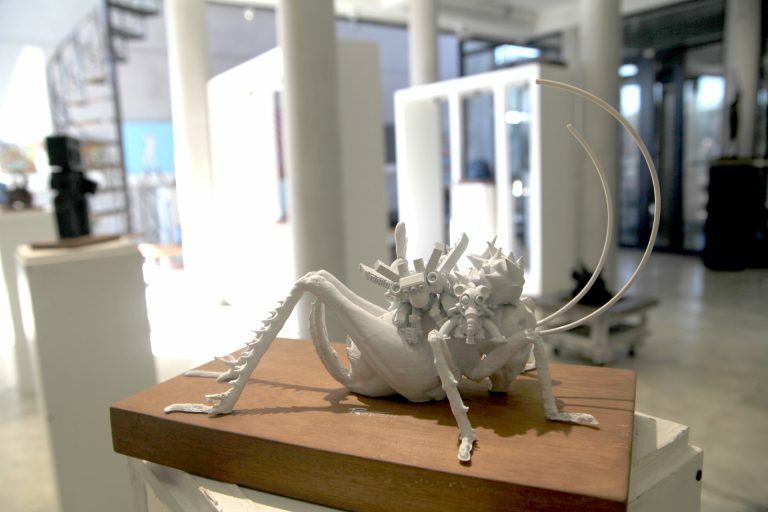 Exhibit in South Africa Displays Fully 3D Printed Art #3DThursday #3DPrinting « Adafruit Industries – Makers, hackers, artists, designers and engineers! For our international readers, the Parktown Prawn, or Libanasidus vittatus, is a type of cricket found in SA. It’s named after the suburb of Parktown in Johannesburg, the country’s largest city. It’s an animal the rest of the world has not had to deal with and, let us tell you, that’s a good thing. While not dangerous, it’s worryingly large and, if Wikipedia is to be believed, can grow to seven centimetres in length. Viewers of the classic Sci-fi flick District 9 are already unknowingly familiar with this bug, as the aliens are referred to as “prawns”. This wasn’t a slur against prawns, those tasty shellfish comparable to shrimp in the rest of the word, but rather towards Parktown Prawns. You can see the similarities in the aliens’ design as well as their love for cat food, as real Parktown Prawns to have propensity for eating food intended for pets. Nomenclature lesson over, Mr Prawn’s story started as a Facebook post. Treweek used his account to put out an odd request that read like a wanted poster: “One Parktown Prawn, dead or alive”. After a few false leads, he was contacted by Donald McCallum, a member of the University of the Witwatersrand’s entomology department. McCallum provided Treweek with the dead insect he needed. With a dead prawn acquired, Treweek needed a way to scan it and create a model to 3D print. To that end, he tapped up Jaco Moolman, an expert in the field of 3D scanning. Moolman’s background is fascinating; we’ll hopefully have a full feature about him soon, but trust us when we say that he knows his stuff. Moolman’s quest to create a truly high quality scan of a bug started with a dung beetle and not the prawn. He posted about this on Facebook and, a few months later when Treweek needed help, he contacted Moolman. Moolman’s first attempt to scan the prawn involved a white light scanner, which would project a pattern on the insect which he could then capture. While potentially a good idea, it would have taken far too much time using Moolman’s old, home-built 3D scanner. Attempt number two involved laser scanning which worked, but didn’t provide enough detail. In the end, Moolman’s solution was to capture thousands of images of the prawn that could be stitched together into a 3D model. This process started off with a 24 MP Sony DSLR camera.